Product prices and availability are accurate as of 2019-04-14 12:36:09 EDT and are subject to change. Any price and availability information displayed on http://www.amazon.com/ at the time of purchase will apply to the purchase of this product. 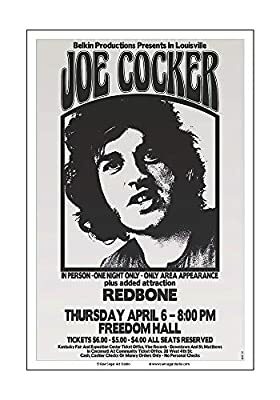 Joe Cocker made his only appearance in the area on April 6, 1972 playing to a sold out audience at Freedom Hall in Louisville Kentucky. Opening the show was Redbone. This beautiful high quality re-print by the original artist, Bear, comes directly from Raw Sugar Art Studio where it was originally produced for this classic concert. Raw Sugar Art Studio for over five decades has been producing some of the most collectible posters for concerts throughout the Midwest and still creates around 250+ posters for tours each year. The actual print size is 11? X 17? in dimension and is printed on 12" X 18" paper so we can print our Trademark and Copyright on the bottom without affecting the integrity of the original poster design and it is in brand new, mint condition. This beautiful high quality re-print comes directly from Raw Sugar Art Studio where it was originally produced for this classic concert. The actual print size is 11? X 17? in dimension and is printed on 12" X 18" paper so our Trademark and Copyright can be printed without affecting the integrity of the original poster design and it is in brand new, mint condition. This poster is a great piece of art for any media room, rec room, office, or den.